Avenida Jaime I, 115, 7180 Calvia-Palma de Mallorca, Spanje. Santa Ponsa Pins hotel is situated 200 meters from the Santa Ponsa Beach sand, and situated in the principal avenue, near de shopping center. 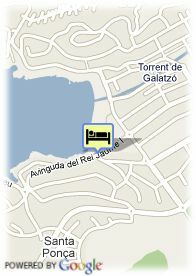 Santa Ponsa in near beautiful beaches like Portals, Fornells, Camp de Mar. You can practise Diving because is a richest submarine zone, like Malgrats Islands. Also there is a beautiful Golf Club in Santa Ponsa. Swimmingpool for adults and solarium. Cafetaria and restaurant - buffet. Money exchange, security box and internet service in the reception. There are 61 bedrooms, double use, single use and family ones. They offer complete bathroom, telephone and balcony or terrace.